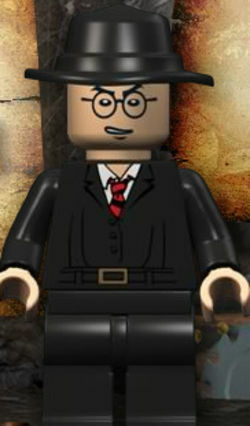 Toht is a character who appears in LEGO Indiana Jones: The Original Adventures and LEGO Indiana Jones 2: The Adventure Continues. He is a high-ranking officer in the German Gestapo and works for the Nazis. In LEGO Indiana Jones: The Original Adventures, his name is just Toht. But in LEGO Indiana Jones 2: The Adventure Continues, his name is Major Toht. In Into the Mountains, Toht comedically sits on the headpiece of the Staff of Ra, causing his rear end to combust. In the last level of Raiders of the Lost Ark, Opening the Ark, Toht dies when he sees inside the Ark of the Covenant. In the film, it burns his hand not his bottom. As a boss, Toht keeps changing where he stays, being a real challenge for new players. In LEGO Indiana Jones 2, he is killed by Belloq.